Almost three years ago we wrote a brief article about interruptions. In that article, we described four methods of dealing with interruptions. I would like to expand on those four methods and add three more to present a comprehensive set of options for organizations struggling with this. The rules of Scrum are clear: if it isn’t part of the team’s work for a Sprint, then it shouldn’t be done. From the moment the team commits to work in Sprint Planning to the end of the Sprint with the Sprint Review, the team needs to be protected from interruptions. If an interruption is truly urgent enough to warrant the team’s attention mid-Sprint, then the Sprint can be canceled. This is a pretty extreme result however since it invalidates the team’s previous commitment. For example, many teams are faced with interruptions related to their support of the software they are creating. In Scrum, deflecting the interruptions forces the team and the organization to examine the root causes of the support issues and fix them. If the team is producing software with lots of defects, then that needs to change. If the team is producing software that is hard to use, then that needs to change. If the team is producing software without the appropriate level of user documentation, then that needs to change. 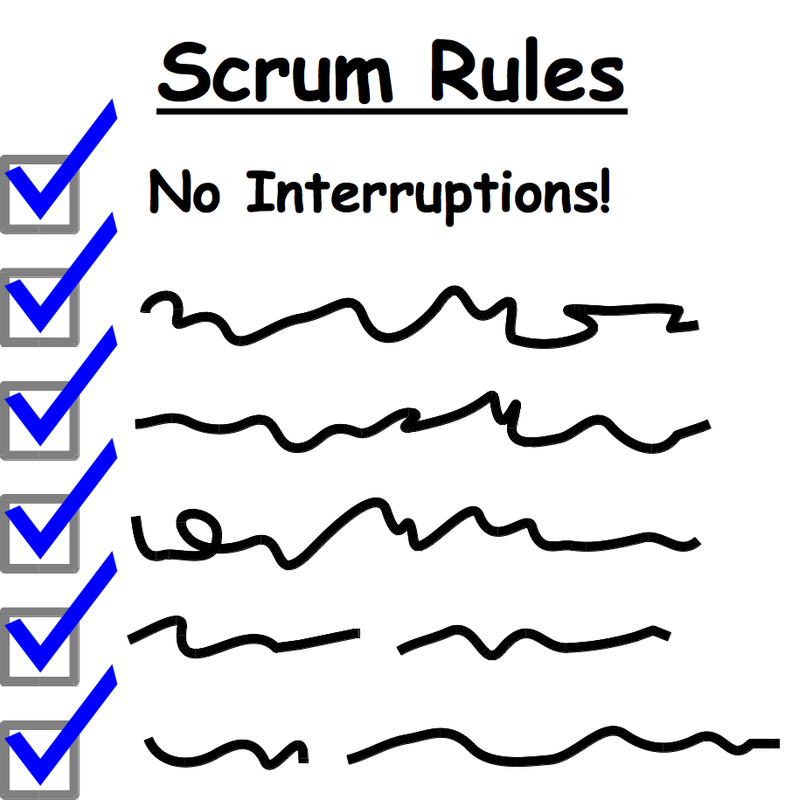 But what doesn’t change is the team breaking the safety of the Sprint defined by the rules of Scrum. Given certain conditions, the amount of interruption of a team can be “stable”. If this is the case, then the team can reasonably set aside a certain percentage of their time to handle interruptions. Determining if this is possible can be done by tracking the occurrence of interruptions and the level of effort to handle them. In a team using this method, there are two ways to allocate this time: everyone on the team gives a certain amount of time each day to handling interruptions OR one or two people on the team are committed full-time for a cycle to handling interruptions. 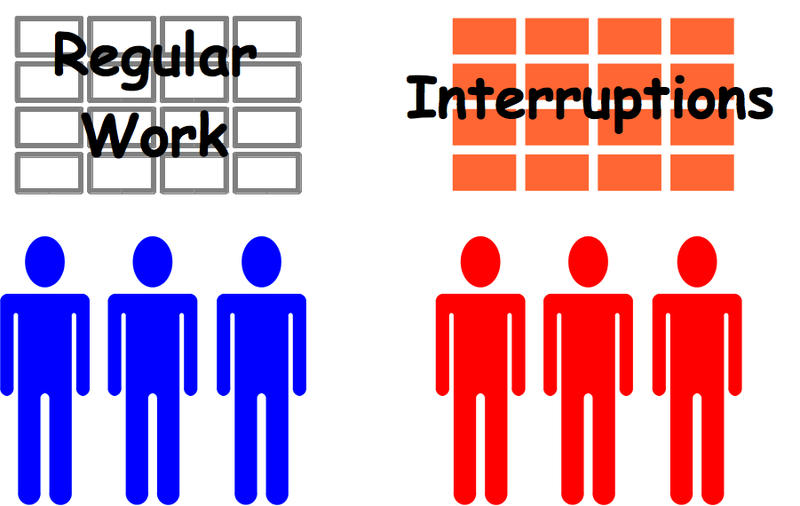 In either case, if the amount of actual time spent on interruptions is less than the amount of time available, then that difference of time must be used carefully. Generally, the best use of this extra time is to work on resolving the root causes of interruptions. For example, if one person of a team is dedicated to dealing with interruptions, and most interruptions come from in-the-field bug support requests, then that person might spend any extra time working on fixing older lower-severity defects. The amount of time that the team is allocated to handling interruptions should never be exceeded otherwise the team’s commitments at the start of the cycle are not really commitments. Another common method of handling interruptions is the “fluorescent note card” method which requires visible stakeholder negotiation around the impact of interruptions. 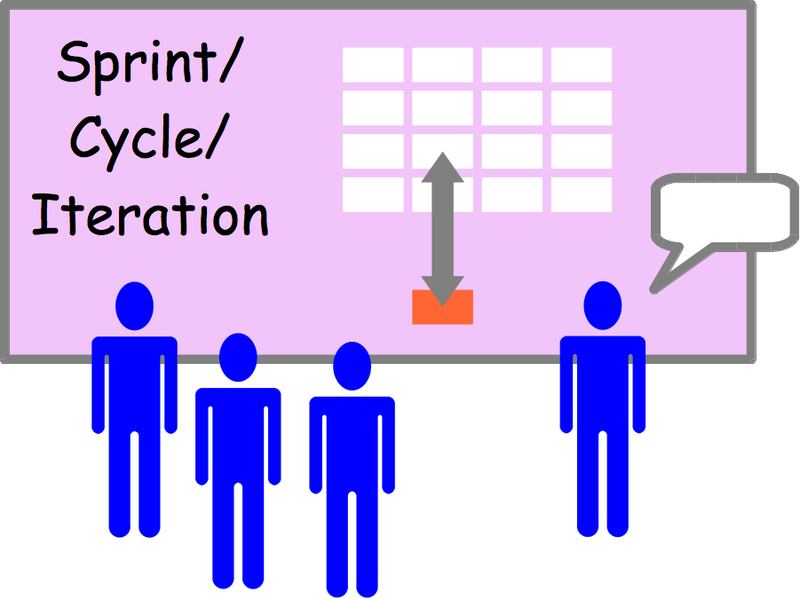 With this method, any time a stakeholder comes to the team with an interruption request, the ScrumMaster/Coach/Process Facilitator writes the request on a bright colored note card so that it is easy to distinguish it from the other tasks the team is working on in their current cycle. The ScrumMaster then asks the team to do a task breakdown on the card and using their normal process (whatever that is) estimates the work effort. The requesting stakeholder then has to negotiate with any other stakeholders (and in particular the Product Owner/Growth Facilitator about what work to remove from the iteration in order to make room for the new work. This process works well primarily because it makes the tradeoffs visible. It does not work so well with letting the team make and keep their commitments which can have a long-term impact on trust. A visible task board instead of electronic tools for task tracking. The visibility makes the change much more immediate and you must have the stakeholders involved right in the same physical space. An electronic tool makes this too abstract and can lead to some important stakeholders not being properly aware of changes. A team that is reasonably good at estimating. By “good” I mean both accurate and fast. If it takes the team half an hour to do an accurate estimate, then that is already a significant interruption in itself! A team should be able to look at an interruption, break down the tasks and come up with a reasonably accurate estimate within no more than 10 minutes. Remember that doing this is already task switching so there is going to be an additional cost to the team. Finally, and perhaps most importantly, a clear agreement must be in place among stakeholders that this approach to interruptions is allowed and that the consequence of it is that the team cannot be held accountable for their commitments!!! I cannot stress this enough! This option is fairly self-explanatory and in fact is just a way of saying that you have a separate support group who deals with interruptions. The more technically capable this group is, and the more authority they have to make changes to the code/database/etc., the more effective they will be at protecting the agile teams from interruptions. In some ways, this is a good approach because it makes the cost of interruptions very visible to the business: how much does your support team cost? If this cost is growing, then it means that the development teams are creating software that is harder and harder to support. If you follow this approach, please ensure that you do not rotate development team members through the support team as this damages the team-building process for both the development team and the support team. A less common, but interesting method for handling interruptions is to have extremely short iterations. In this method, choose your iteration length to be so short that you can always start work on urgent interruptions before anyone gets impatient! This can be exhausting, but it is one of the best ways to get the team and the organization to understand the large toll that these interruptions take. 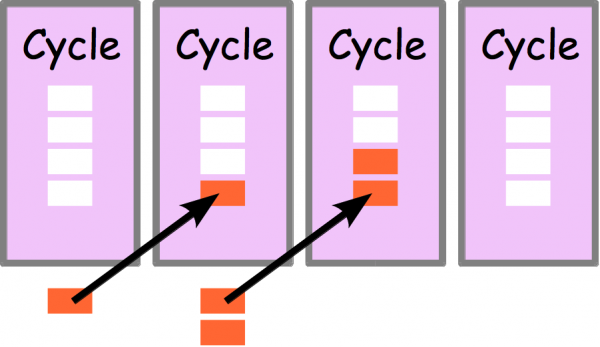 There is a simple way to determine how long your cycle should be based on measurement. Choose a “normal” duration (e.g. one or two weeks) and for several cycles track how many interruptions are submitted to the team, and how urgent is the turn-around time on those interruptions. After several cycles, the team can then adjust its cycle length so that, on average, the team is able to start and finish a cycle in a time shorter than the expected frequency of interruptions. There is nothing inherently wrong with continuing with your current approach to handling interruptions. 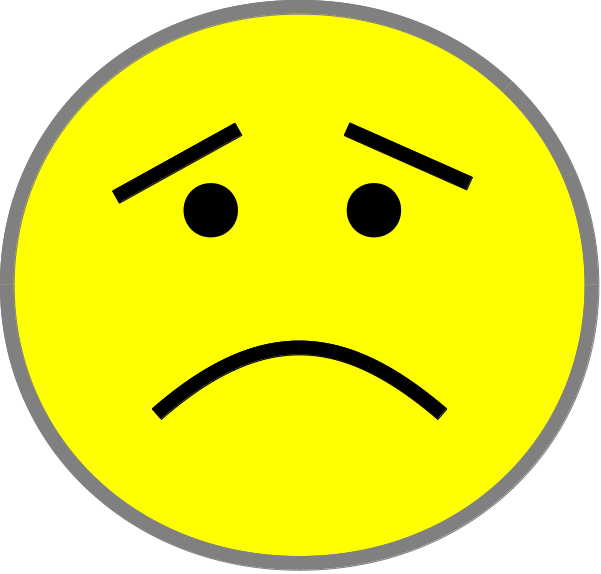 It probably makes some people miserable, but there are also some people who really enjoy crisis and constant change. In fact, it may be part of the culture of your organization or something that is strategically important in your particular industry. That doesn’t mean you can’t be agile, but it may mean that you are making compromises where you are trading off team performance for some other benefit. it is important that if you choose to continue with your status quo, that you make the trade-off transparent. Tell everyone on your teams exactly why you are making the trade-off and what is the expected benefit of doing so. The most sophisticated option is based on measuring a special kind of velocity called “Commitment Velocity”. This is a mechanism that allows both interruptions to be handled mid-cycle and for teams to make commitments that they can keep. 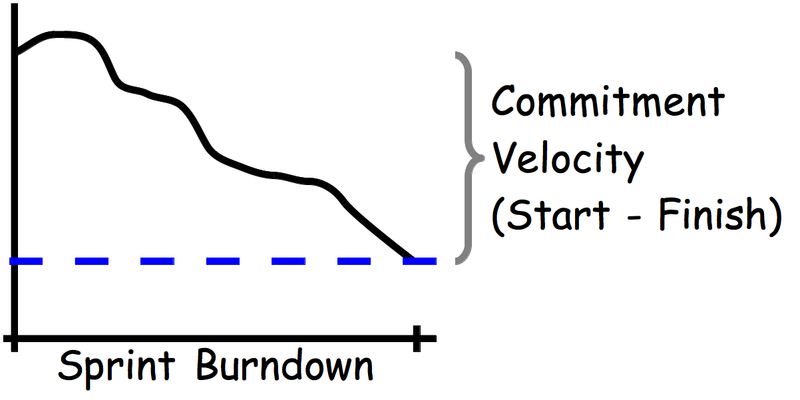 In the simplest terms, Commitment Velocity is the minimum historical slope of a team’s Sprint burndown. For example, if a team in Sprint 1 has 240 units of effort at the start of the Sprint, but, partly due to interruptions, does not finish and then has 40 units of effort left unfinished at the end of the Sprint, then the Commitment Velocity (slope) of the team is 240 – 40 = 200. In their next Sprint planning meeting, they would plan such that they had at most 200 unites of effort in their Sprint plan. The team then does their second Sprint and again, partly due to interruptions, they don’t finish everything. Perhaps this second sprint started with 195 units of effort (<200) and finished with 10 units of effort remaining. Their new Commitment Velocity is 195 – 10 = 185. They do a third sprint, but they finish everything. It is tempting for the team to perhaps take an average – maybe they finished 200 units of effort in their third Sprint so they average 200, 185 and 200 leaving 195. This is not Commitment Velocity. By definition, an average means that the team will successfully complete all their work 50% of the time. Instead, the team maintains its Commitment Velocity of 185 for their fourth Sprint. By the law of large numbers and the central limit theorem, as the team uses this tool of Commitment Velocity for more and more Sprints, eventually their ability to keep their commitments, even with interruptions) will become closer and closer to 100% certain. Ultimately, the most important thing in selecting one of these options is to do so consciously and in the spirit of learning that underlies agile methods. Choose an option and then stick with it long enough to truly understand if it is working for you or not. If you are trying to do a dramatic improvement in how your organization gets stuff done, I would recommend choosing either Option One (Follow Scrum Strictly) or Option Seven (Commitment Velocity). Both of these are options that put pressure on the team and the organization to improve. 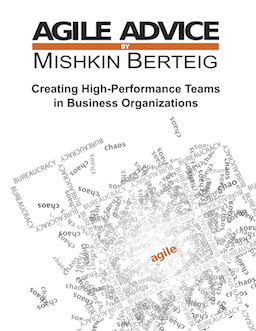 If you don’t have strong executive support for Agile, then probably Options Two (Time Allocation), Four (Separate Team) and Five (Short Cycles) are going to be your best bet at first. If you do have strong executive support, but you aren’t desperate to improve your organization, you might consider Option Three (Visible Negotiation). Of course, Option Six (Status Quo) is the easiest… I don’t really recommend it though! Agility requires systematic change to encourage continuous improvement. All the other options assist with this. I like your focus on the root cause of the interruptions. They are often caused by poor quality or poor planning. In either case, the root cause must be addressed or the team will be continually impacted. Hi, thanks for this list, which is a powerful tool for finding the right approach in a specific environment. Means, the team has to stay on 190 as the is the lowest number they made even if they continously deliverd more then this velocity??? It is very important with Commitment Velocity to keep lowering the number since we are trying to make _commitments_ not _averages_. If you took the average then the team would accomplish all its work 1/2 the time, and the other half would have work left over. If the team finishes it’s work in a Sprint early, then they are welcome to take on more work, but it does not count towards its Commitment Velocity. Basically, with Commitment Velocity, we are trying to measure how much time the team needs to leave aside each Sprint for the unexpected. I hope that helps explain! This is a really helpful article for my current work dilemma. My development team struggles with balancing committed vs ad hoc tasks, so these suggestions will really bring structure to the sprint planning process. I’ll be suggesting Option 2! We re currently using a mix of option 4 and 5 : having dedicated people for interruptions + a shorter (1 week) “sprint” to have a sprint backlog mainly based on root cause corrections. That means this team is “prepared” to get interrupted and there is a lower commitment on the tasks since some unplanned high priorities may still arrive within the 1 week iteration. In the end, I believe this is more a kanban/scrum mix or “timeboxed kanban”. But in the end, I believe that reducing these interruptions by increasing code & planning quality should, indeed, be the main goal. Glad to hear you found this article useful. As you mentioned, improved code quality and planning quality can help. Most teams experience a mix of interruptions generated internally or from the normal variation in their processes (common cause variation, e.g. automated test coverage or lack thereof) and interruptions or disruptions that are completely outside their control (special cause variation, e.g. a surprise all-hands meeting). Often the improvements in productivity and flow from reducing common cause variation are low compared to improvements from reducing special cause variation. As such, one of the key aspects of the Scrum Master is service to the organization: to make problems visible, to guide the organization on root cause analysis of those problems, and to coach the organization to solve those problems. This organizational focus is missing in many Scrum adoptions and is one of the main reasons that we find so many instances of Dark Scrum as consultants and trainers. If you are interested in learning more about common and special cause variation, I recommend the Lean Kanban University’s KSD and KMP training. We offer those courses if you are ever in the Toronto area: KSD Toronto and KMP Toronto.